5 Comments Published by Cedric Benetti on Saturday, January 10, 2009 at 1/10/2009 12:49:00 PM. 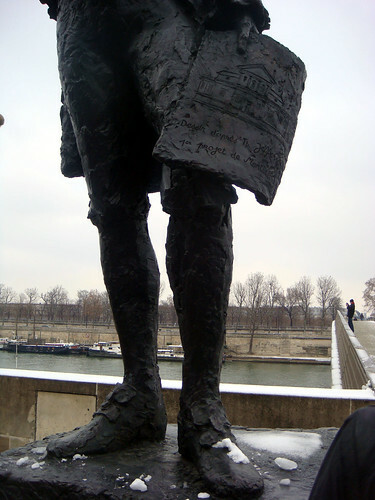 On the Quais of the Seine, next to the passerelle de Solferino, stands a bronze sculpture of Thomas Jefferson, holding in his hand the early designs for Monticello. 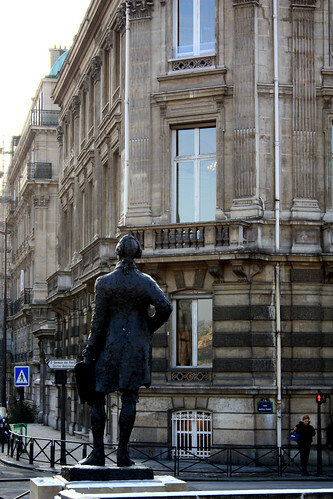 The statue stands behind the Hotel de Salm, Palace of the Legion of Honnor, a building which inspired Jefferson a lot during his stay in Paris. He enjoyed the hotel's serene lines and symetry so much that he actually recommended it as inspiration to L'Enfant and also to Bulfinch, who would later go on to design parts of the Capitol building in DC on his inspirations drawn from the Hotel de Salm. I must say I haven't seen that statue in my travels to Paris. Maybe the next time I am there I'll put it on my list of things to see. Paris is very beautiful! I wish I could go there soon...Thank you for sharing! Hi! Chance upon your interesting blog, I'm writing from CozyCot.com, Singapore's best loved online beauty, fashion, lifestyle, shopping portal and forum. CozyCot.com is looking for bloggers and blogging partners to act as Ambassadors and we would like to invite you to be one! If you like to get rewarded, drive traffic to your blog, write in to us today at blog@cozycot.com. I like the faces of these kinks of old building. In our city(Canton),there are some these kinks of building founded in the middle of 19 century. But their outlookings are changed a lot by the mordern man. I like the good protection of them. Thanks for your guiding. Can I download your picture and set in my blog(I will mark them from your blog),wish your reply soon. Make me a House out of Sugar! Finally a White Winter Paris!